The weather has taken a turn for the worst, and this painting of the return of bright days, was probably a little premature. Today I painted a picture more in keeping with the current conditions, called ‘Bleak Winter’ which I will post in a few days. Cobalt Blue was used in this sky colour. It is a ‘soft’ colour and has a warm feel to it (see previous post about materials used in this painting). If you look at recent paintings where Prussian Blue was used you will see what I mean by ‘soft’. It will mix with most colours to produce beautiful shades. If you are a beginner, and can have only one blue – make it Cobalt Blue. It can be altered to fit most sky types, even cold winter, because of its excellent mixing ability. The next painting, mentioned above, also has Cobalt Blue, but the final effect is very different. 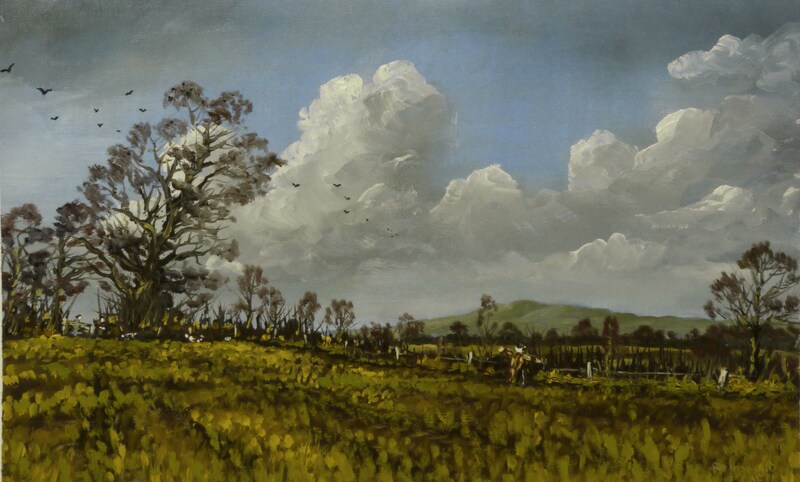 This entry was posted in Oil Painting and tagged Art, Culture, Education, Inspiration, Irish landscape, Oil Painting, Oil Painting Instruction, Time lapse painting. Bookmark the permalink. I really get alot out of your time lapsed presentations. Thank you for sharing this insight. This is very helpful to watch. I liked seeing how the sky and trees are developed and how you use thin applications of paint. Yes, cobalt blue is a wonderful color in acrylic and watercolor too. Thank you. This video is amazing, love seeing how work is developed. And thanks for the like by the way. oh, those clouds!!! I remember being fascinated by clouds since I had to learn the names of each type in elementary school, now watching your technique and seeing them take form is breathtaking, I need to try painting clouds while watching your videos! !